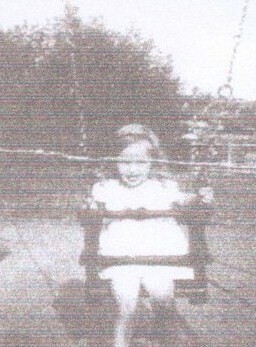 I was born on the 15th March 1938 in the Marnham Ward at Hemel Hempstead General Hospital (then known as West Herts Hospital), and christened at St Mary’s Parish Church, Wendy Jean Stacey. 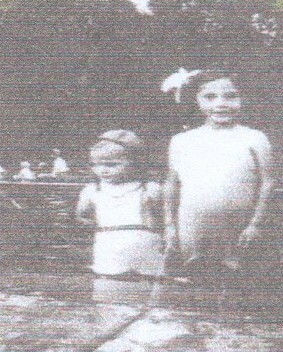 When I was a small child evacuees came to live with us at 11 Church Street in the old town, a Mrs Norman and her two children, Margaret who was 15 and Geoffrey who was 11. Margaret I loved, but Geoffrey I hated!! I cannot remember how long they stayed with us, and unfortunately we never kept in contact. I began school in 1942 aged four years. My first school was Queen Street Infants, which was opposite the garage in Queensway. I can still see that classroom with pictures all round the painted brick walls of numbers and letters of the alphabet. One that stands out in my memory is of five bright orange carrots on a black background with the number five at the end. We had little slates to write on with slate pencils. The first song I ever learnt at school was ‘Bless this House’. My teacher’s name was Miss Pallitt and I remember her as being a very kind person. We used to walk to school through the alleys, as they were known, and on the way had to pass the iron foundry, which was at the back of the High Street behind the Rose and Crown. Standing at the doorway looking in you could feel the heat of the molten metal. The men all worked with bare chests, summer and winter. Opposite the iron foundry between George Street School and Queen Street School the ground stretched up to Alandale (then the Redbourn Road) and was full of heaps of metal and iron scraps. Also on this piece of ground were the air raid shelters for the two schools. In 1944 I moved up to George Street Junior School, a red brick building, which is now used by the National Heath Service, a new school having been built next door. Our headmistress was Miss Parkins who was very strict; she actually lived at the school. My class teacher in my first year was Mrs Gidner, who was the opposite of Miss Parkins. On a Friday afternoon she always read stories to us as well as bringing cakes and jam tarts, which she had baked. I remember a large picture of Jesus surrounded by children with the words ‘Suffer little children to come unto me’. After I left George Street I attended Corner Hall Girls School in Crabtree Lane, which was right at the top of the hill. This school was demolished a long time ago. On Sundays I attended Sunday school, which was held in St Mary’s Hall in George Street just below the school. The main hall was painted all round with pictures of the United States e.g. ‘The Statue of Liberty’, ‘The Golden Gate Bridge’ etc. These were painted by the American service men who used the hall. I cannot remember when this was demolished, but it was still there in 1957 as I held my wedding reception there. On the first Sunday of every month we had to attend morning service at St Mary’s Church. It always fascinated me to see the boys from Gadebridge School walking through the town to church with their straw boaters on. Early in 1943 I was taken ill with scarlet fever and was admitted to the Isolation Hospital. This was at the top of Saint Alban’s Hill opposite the town sewage farm, where the Ski Slope now is. I was in there for about six weeks and had my 5th birthday there. We were not allowed any visitors. A place we were often taken to was the children’s playground and paddling pool, where the Kodak building now stands. We always had great fun there. As the train went by the engine driver would wave to the children. This was the ‘Nicky Line’, although to us it was always called ‘Puffing Annie’. When I was about 10 years old I remember paying one or two pennies for a ride from Heath Park Halt to Midland Road Station. When the war ended we had a wonderful street party with fancy dress and a huge bonfire was built in Randalls Park. I lived in Church Street, which was only a small road then, and backed onto Randalls Park. We used to walk across the fields at the top of Church Street to Piccotts End, to play by the river Gade. At the back of the Marchmont was a piece of ground where the Gade divided into two for a short distance, and this was ‘our island’. There was no road running through the park then. We also played on the area where I now live: ‘Cattsdell’. 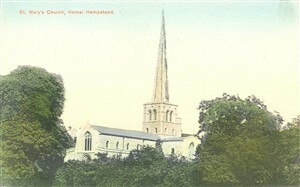 This was called Mimsfield and backed onto St Paul’s Hospital. There was a children’s home next to the hospital called Cattsdells hence the street name. Sometimes we were allowed into the home to play with the other children. In Alexandra Road there was another children’s home for Jewish children, this was called ‘The Chestnuts’. Another couple of places we used to play were along by the Nicky Line and also the gravel pits, which were between the roundabout at the top of Queensway and the roundabout at Cupid Green on the side where the car scrap yard is. The watercress beds in Alma Road where for 6 old pennies you got a large bunch of watercress. Ptle and Thomsons where we took the accumulators to be recharged. This shop was in Alexandra Road. Woolworths, which was opposite Burton’s the Tailors (now the Pine Shop). Over Burton’s was a billiard hall, later The Betty Bousten Dancing School. Goodworths, one of the many grocer’s shops in the High Street, this was next Woolworths. Boots the chemist was on the corner of George Street. The market, which was in the High Street then. On the corner of the market was the town library. Now the Volunteer Bureau. Rolphs, the Ladies and Gents outfitters, was further up the High Street on the right hand side. This was a rather large shop with a basement. This was later Wagoners the Art Shop and now Alberto’s the Italian restaurant. A little further on was a small bakers, I have forgotten the name. Here we purchased a dozen bread rolls. At the top of the High Street on the left hand side was a butchers shop called Pearmans. This now is a private house. Here my friend collected her mother’s ration of corned beef. Walking up Cherry Bounce at the end of our shopping, a slice of this corned beef in one of the rolls always went down very well. One other shop to mention was a fish and chip shop just past the old market. Where for a threepenny bit you could buy two pennyworth of chips and one pennyworth of scrumps (delicious). Every year the Statty Fair visited Hemel Hempstead. This was held at Hand Post Farm in Old Queen Street where the Garage in Queensway now stands. Occasionally a circus would visit also at Hand Post Farm. The buses in those days came along Marlowes, turned left into Alma Road, along by the watercress beds and right into Bury Road. The buses all lined up outside the Bury ready to start on their return journeys. Alma Road was where the Dacorum College is now. Having no bathroom at home, every Friday evening (women’s night) we used to visit the public baths for our weekly scrub. These baths were opposite the Baptist Church. Next to the baths was a garage called County Garage. Next to this was the Methodist Church. Over the garage was a small factory called the Toy Studios, where they used to make and paint toy farms and forts etc. On the corner of Alma Road was a public house called the Sebright Arms, next to this was a children’s clothing factory called Polly Flinders. We were taken on a school trip to see the dresses etc being made. Where the funny roundabout is now the three roads Lawn Lane, Two Waters Road and Station Road all merged into one road, Marlowes. No roundabout then. There was a café between Lawn Lane and Two Waters Road. This was called The Triangle Café; also here were public toilets. When we were about nine years old we were taken from school to the Old Town Hall in the High Street to see a model of the New Town. To us as children this all seemed pretty wonderful. A new shopping centre, Marlowes, was full of dingy old shops, the largest and only one with an upstairs called ‘Hendersons’. A new cinema to replace our two very old cinemas, the Princess and the Luxor, water gardens and a grand pavilion!! Which has now been pulled down. These are just a few memories of my childhood. This page was added on 24/02/2011.